Rain ended Ireland's perfect record at the ICC World Twenty20 Qualifier after Thursday's game against Italy was abandoned without a ball being bowled. It was an unlikely scenario in the desert setting of Abu Dhabi and the team picked up a point apiece. Ireland had won their opening four qualifying matches to sit top of Group A and firmly on course for the World Twenty20 in Bangladesh next year. The Irish are back in action on Friday with Uganda their opponents. Uganda also suffered a washout on Thursday for their game against the United States. William Porterfield made history on Wednesday by becoming the first player to make a century in Twenty20 cricket for Ireland. The Warwickshire opener smashed an unbeaten 127 from 69 balls in the 75-run win over the US. 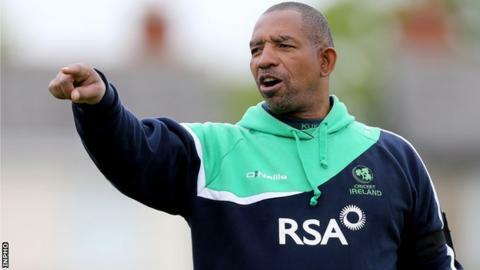 Phil Simmons's team have also chalked up victories against Namibia, Canada and hosts UAE. Two more wins, against Uganda and second-placed Hong Kong on Sunday, would see Ireland seal a place in the semi-finals as group winners.